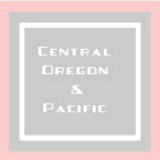 The Central Oregon and Pacific Railroad usually runs two haulers or manifest trains each day out of Medford, Oregon. The South Hauler typically leaves in mid-morning and returns in the early evening. The North Hauler leaves sometime after 9 PM and meets a southbound train out of Roseburg at Glendale in the wee hours of the morning. Here the two trains swap cars, do any switching at Glendale and return to their respective terminals shortly after dawn. This way, the cars get moved expeditiously and the crews don’t have to lay over away from home. Bud Shirley invited me to ride with him on the North Hauler one early autumn evening last year. Knowing that I’d be up all night, I packed a thermos of STRONG coffee, some sandwiches, the camera (we might get back late enough for a few pictures), and a warm jacket. I met Bud at his house and off we went for a night of railroading. At the depot, we meet up with Bud’s co-worker, Matt Shaw. CORP has “transportation specialists” instead of traditional engineers and conductors -- the idea being everybody is qualified to work either position and can trade off working the ground with running the train. Usually the power is kept right next to the depot, but tonight the hauler power is nowhere to be seen. The north and south haulers use the same engines and the south hauler, which had just returned, had left the power at the north end of the yard. We’re informed that the PM switcher has taken over the power and is building our train for us. Shortly the McAndrews Road gates come down and tonight’s North Hauler backs slowly past the depot. Bud and Matt are out of the office and on both sides of the tracks giving it a roll by. Tonight’s train is a good one -- 9 loads, 17 empties and at least one “passenger” camped in a log car (not a very smart move given the likelihood of a shifting load). The power, two ex-BN GP-40’s (still in green and lettered CORP) and a red CORP GP-38 ease to a halt in front of the depot and we hand up a couple ice chests, assorted lunches and our grips. A final air test is made and we are promptly on our way. We were barely rolling when Bud switched into dynamic braking. The Medford yard is .6% downhill towards the north. In fact, with a few brief exceptions, it's all downgrade from Medford to Grants Pass. SP once rated a SD-9 at 10,000 tons in this direction. The engines rock gently through the night air, heavy with the aroma of freshly sanded plywood, past Timber Products, Medite, Georgia Pacific and the Central Point stud mill. As the Grange Coop fades into the distance we’re alone with the night and the occasional lower quadrant signal. Onward, under Interstate 5, and past the wye at Tolo where the semaphores have been replaced with tri color signals. One of them shows red as we approach it, just short of the yard board. After brief but complete stop, we’re underway again. It is one of those late summer nights that is warm enough to enjoy being outside without a jacket, but cool enough to remind you that fall is just around the corner. I step out onto the walkway behind the engineer to savor the night air, the roar of the Rogue River as it rolls over Gold Ray Dam, and the brush and trees illuminated by a rising moon. A gravel road below the tracks follows the Rogue between Tolo and Gold Hill giving folks access to the river and numerous unofficial camp sites and party spots. Bud tells the story of how the previous Friday they had rounded a bend and been presented with a moon of a different sort than the one which is lighting the countryside. Some fellow was standing between the rails, bent over, his pants lowered and his backside exposed. Matt had cooled his buns with a well aimed splash of ice cold water from the cooler. We speculate if this guy will be back again. A couple more curves and Bud announces that there are some guys on the tracks up ahead. Just as the headlight and ditchlights caught them, all seven of them drop trou and bend over. Since we were only moving 10 mph due to slow orders, they have quite a chance to display their rumps as the three of us in the cab howl with laughter. As we approach, Bud toots the horn a couple times and the last of them hobbles off the tracks pulling up his pants. Matt, however, has a idea. "Quick, move over and open the window." he tells Bud and I as he grabs a 5 gallon cooler full of ice and water. The mooners have been temporarily blinded by the lights on the front of the train and can not see what is about to come out of the cab. DOOOSH! Matt's aim is right on and a couple of them really collect in the ice and water department. For several miles we plot about taking the water cars next Friday and really giving those guys a bath. On through the night we roll, the locomotives barely above idle as we ease across the Rogue and through the town of Gold Hill, awakening more than a few souls as Bud blows the horn for the state highway protected only with crossbucks. A few more miles and we're paralleling Interstate 5 with cars and trucks speeding past our 25 mph gait. No signs of life in my hometown of Rogue River as we rock along past the first of a string of semaphores and duck under the Interstate. This is my home turf and I'm amazed how different it all looks at night from the cab of a locomotive. Maybe it's the hour, but it's like roads I'd driven hundreds of times materialize out of nowhere -- I'm not lost but it sure seems different out there tonight. We enter the yard limits at Grants Pass about the time the dispatcher in Roseburg calls to find out our location. No other trains are on the line and our track warrant is good all the way to Glendale, but he is just keeping tabs on us and making sure we're all awake. The Grants Pass yard is home to some less fortunates and we keep our eyes out for them. Drunks in our path, vandalism and objects thrown at our train are all a concern. On past the darked yard office, the 7th and 6th Street main one-way street pair, and back into the west side residential neighborhood we roll. Finally we start up a grade, the first real one since we left Medford, and Bud eases out on the throttle. We both comment on the location where we caught the SP West and East Haulers a few years ago in an encounter called Siskiyou Grande, and how that series of pictures could never be duplicated. Of course, the Rio Grande tunnel motors are gone, never to return, and even the semaphores are now gone. I mention that it's more fun to be riding with Bud now than it was to take those pictures with him back in 1994. Bud agrees. On this1.6% grade Bud alternates the throttle between 5 and 6; we look down on the lights of the City of Grants Pass on our left. A set of semaphores mark the top of the grade and Bud has his hands full backing off on the throttle, shifting into dynamic braking and letting the slack gently run in while he works the bell and horn for a grade crossing. The moon (the one in the sky, that is) is gone now, covered by clouds and it's pitch dark out now as we descend into Merlin. We pass the old Miller Redwood mill, once the town's major employer, which now sits empty awaiting redevelopment or dismantling. The bridges over Louse Creek and Jumpoff Joe Creek mark the end of the grade down from Granite Hill and the beginning of Merlin Grade up to Hugo. This one's nearly 8 miles of 1.5% at a 10 mph slow order and has little in the way of grade crossings, curves, or even lights. I'm sitting on a chair with my head leaning against the electrical cabinet listening to the chant of the EMD 645 in Run 6 behind me, feeling the gentle rock and roll of the cab and watching the head lights play off the rails ahead. Slowly I'm aware of being over taken by sleep. It's a dream-like sensation drifting in and out of consciousness. I awake with a start. Where are we? Bud looks over, "You fell asleep, didn't you?" I confess I dozed off for a minute or two as I look around and find we're still on the grade running at 10mph. With this short nap, though, I am beginning to realize what thousands of railroaders go through each night all across the country. Here I am, a railfan, on my first cab ride in a year and I go to sleep! I can only imagine what it's like doing this night after night. The grade eases a little as we pass the Wig Wag at Three Pines Road and round a sharp curve going into Hugo. A pair of tri-color signals mark the south end of the Hugo siding but semaphores still guard the north end on this night. (These would be removed along with all other semaphores from Hugo to Glendale in 1999.) From my position looking out over the short hood of the locomotive and with the fallen leaves on the ties, it looks as if only rails support our train as it twists and winds its way through the forest. Suddenly, the roar of the diesels intensifies as we enter tunnel 9. Bud throttles down and we can hear the click-clack of the wheels echoing off the tunnel walls. Soon he kicks in the dynamics, notches the throttle back up and the tunnel is filled with the higher pitched whine of the fans dissapating heat off the brake grids. Shortly, we're out of the tunnel into the still night above Leland. I'd hiked, railfanned and even swam under the high trestle over Grave Creek and was really looking forward to that crossing. From below it looks high and long. But, at night from the train, it looks short. As we start across, the ground drops away into nothingness below. The only sense of motion is the rail running beneath us. Soon enough the bank on the far side approaches us and ground wells up from the void below and we are back on solid ground. The line along Wolf Creek is flat by Siskiyou Line standards (less than a percent) but we're definitely going uphill as we wind through the darkness punctuated by an occasional yard light and, of course, the green eye of a semaphore every couple miles. "Civilization" appears briefly when we pass through the town of Wolf Creek and its freeway interchange. Following the freeway for a few hundred yards we start around the Wolf Creek Loop and get into some serious grade again. From the top end of the loop Wolf Creek looks almost like a scene from a model railroad layout (with moving car lights on the Interstate, no less). Not another light in sight as we climb and twist through the mountain night. After a couple miles, a green light shines off the railhead from semaphore 5050 near the south end of tunnel 8. (I was unable to appreciate this beautiful but inaccessible location until I hirailed into it with Rick Perry). Past the semaphore, around a gentle curve and we're into Tunnel 9. Bud again has us out of "power" and into "braking" as we exit the tunnel a few miles south of Glendale. Shortly, Bud is on the radio to the Roseburg-Glendale job and finds that they have completed their switching and have our train on the siding while they are positioned on the main. This is confirmed as we pass the last semaphore before Glendale displaying an Approach indication. Soon the red eye of a tricolor signal looms around a curve and we ease to a halt a short distance from the south switch at Glendale. Matt goes back and ties down some handbrakes and prepares to cut our power off from the train. Bud confirms that the other train crew has us lined into the siding and trades FRED frequency information with the other engineer. On Matt's signal, Bud comes out on the throttle and we ease past the red signal, the siding and gently couple onto our train new. After we swap ends (move our assorted grips, radios, and lunches to the south locomotive) the other crew comes up to exchange paperwork and small-talk. Soon, our air test is complete, we receive a new track warrant to go south and we're headed back up the hill out of Glendale. As is so often the case with train rides, the return trip seems to go by faster than the trip out and tonight is no exception, especially as I find myself trying to doze off again. Punctuated by green signals every mile or two and an occasional set of crossing signals, the lights of Wolf Creek, Hugo and Merlin drift past in the darkness. Eventually, the sky starts to lighten in the east and staying awake becomes easier. Dawn finds us rolling through largely deserted downtown Grants Pass. By the time we cross the Rogue River at Gold Hill it's light enough to try to take some pictures. Special Thanks to Bud Shirley for inviting me along and for the background for this page. See, Bud is an inveterate CB&Q fan. You'd think driving locomotives painted almost like the "Q" would be enough, but, Noooooooo.